Enabling new CEOs and executive leaders to "take charge" in a rapid high engagement manner to launch the next major phase of their enterprise. Equiping siting CEOs and executive leaders to successfully transform their company's course and accelerate growth. The definitive guide to sucessful corporate transformation. 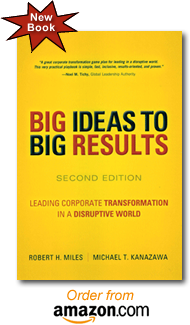 An executive briefing for the executive leader who wants to apply the same winning approach developed by Robert H. Miles and used in the extraordinary transformations of some of the nation's top corporations. "In this book, one of the world's most experienced change agents identifies the skill set required of leaders at all levels in the enterprise to drive sucessful corporate transformations. This book should become required reading for all managers in a business undergoing fundamental change." Harvard Business Review January-February 2010, pp. 67-75. Reprinted in the “Reinvention” issue of HBR OnPoint, Spring 2012. Employees," by Robert H. Miles, Organizational Dynamics , Special Edition, Summer 2001. "Accelerated Organizational Transformation: Balancing Scope and Involvement,"